Situated in the heart of Kenya’s legendary Maasai Mara Game Reserve, Entim camp is right in the middle of the very best game-viewing areas. While many other visitors to the Mara will be staying in camps in the surrounding areas and conservancies, at Entim you don't have to drive for hours to get to the wildlife action because you are right there in the middle of it. Nor do you have to be hurried out of the Reserve before gates close at 6.30 pm: There’s actually no obligation to go out on game drives because you can sit in camp and watch the animals passing by right in front of you. 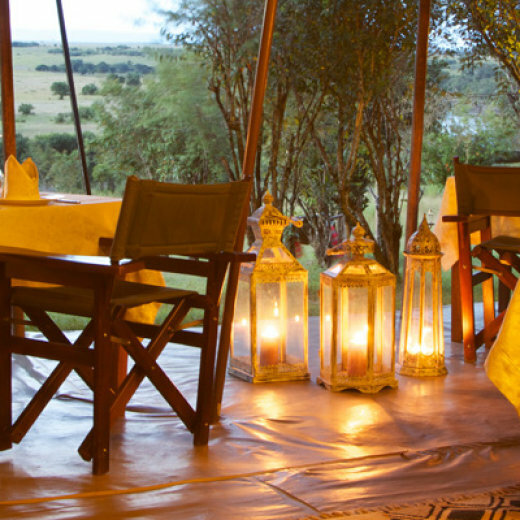 Entim Camp hosts 10 luxury tents, accommodating just 10 guests in utmost comfort, amidst breath-taking scenery. Entim's decor aims to enhance the surrounding environment. All tents are well-placed, and en suite with flush-toilets and hot showers. There is a cosy lounge area with a small library, separate bar and dining area, which is opened upfront, allowing guests the unmatched experience of eating meals while watching the animals move to and from the river to drink and forage for their food. The camp has been designed to give guests the feel that it is part of the landscape. The experience at Entim is not your average hotel or lodge experience: it's about being right in the hub of one of the most famous wildlife reserves in the world. The dining area offers a more intimate setting for the delicious home-cooked meals. There is a selection of house wines from the famous wineries of South Africa. Bread, cakes and pastries are all baked in the camp, while fresh produce is flown in regularly. Entim aims at producing healthy, balanced and enticing menus, and are happy to cater to your individual requirements.